At last month’s throne speech the provincial NDP announced a number of policies to be implemented in the coming year. While interest-free student loans have been heralded as a major treat for post-secondary students, a number of other policies that will affect students have been proposed. Among those is a two-fold increase in the number of courses to be offered online – from 500 to 1,000 across the province. “We will build on the significant steps taken over the last decade to ensure post-secondary education is accessible and affordable,” said Premier Greg Selinger in a speech to media on Nov. 20. 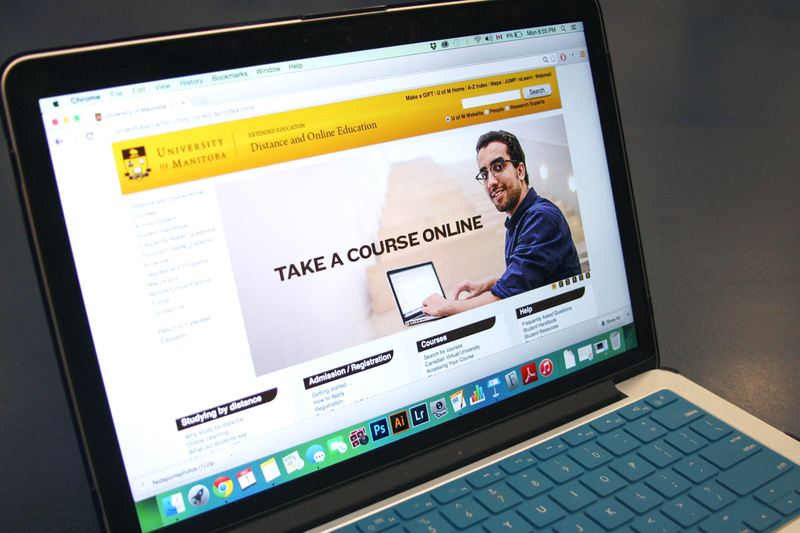 Enrolment in online courses is already on the rise at the University of Manitoba. In the 2013/14 academic year, 9,318 U of M students were registered for online courses. That represents a 42 per cent increase from 2009/2010, when 6,547 students were registered for online courses. In 2013/14, 151 online degree credit courses were offered across 12 faculties and 28 departments. Extended education at the U of M, which oversees distance and online education, does not have access to the number of students who graduate either entirely or primarily through online courses. Currently, U of M students may complete their bachelor of arts, bachelor of arts in geography, bachelor of social work, or post-baccalaureate diploma in education by taking distance and online education courses. Students completing their bachelor of arts with distance and online education are able to major in Canadian studies, criminology, economics, English, geography, history, philosophy, political studies, psychology, and sociology. Students who live in the city must come to the Fort Garry campus to write their exams as a component of online courses that have final exams. Students who do not live within city limits are not required to visit the campus; another location is selected. Lynette Phyfe, interim director of distance and online education, told the Manitoban that online courses provide greater flexibility for students when it comes to time management. The Canadian Association of University Teachers released a policy statement, last revised in 2009, which outlines its position on distance education. “[The Canadian Association of University Teachers] is dedicated to the removal of barriers that traditionally restrict access to and success in post-secondary institutions and to increasing equality and equity of educational opportunity for all Canadians. The statement also lists a number of items that faculty associations should ensure are included in contract language as part of an effort to maintain a high-quality level of education. The Canadian Association of University Teachers’ member associations include faculty associations from across Canada. Locally, these include the University of Manitoba Faculty Association, the Brandon University Faculty Association, the University of Winnipeg Faculty Association, the St. John’s College Faculty Association, the Association des professeur(e)s de l’Université de Saint-Boniface, and the Manitoba Organization of Faculty Associations. David Camfield, associate professor of labour studies and sociology at the U of M, was critical of the proposed increase in online courses being offered in the province. “Expanding access to post-secondary education is a good thing. However,” Camfield continued, “I also have concerns about the quality of education. Not all courses are equally suitable for offering online. In-person classes with small class sizes offer unique opportunities for learning. We need more of them; but, because of budget cuts, there are fewer of them available to students. Zach Fleisher, chairperson for the Canadian Federation of Students-Manitoba, shared some of Camfield’s concerns. However, Fleisher said that if the courses were used to help rural and distance students, then it would be a benefit to post-secondary students. “I’m often wary about the usage of online courses on university campuses as there are concerns regarding the ‘mass production’ of education, which could theoretically lead in turn to less professors and offerings. In my personal experience as a student, I’ve often leaned towards the in-classroom experience. Fleisher noted that specifics in implementing the plan were not yet available and said that he would be monitoring its execution. Danielle Murphy, U of M human nutritional sciences student in the faculty of agriculture and food sciences, said she had some difficulty the first time she took an online course. “I took Statistics 1000 online for about a month before the first midterm; then I ended up dropping it. Murphy said she did better when she took the course on campus the following semester, but that she would still recommend online courses to other people. Sabine Hergenreiter, a U of M student taking prerequisites for nursing, has also taken online courses in the past. “I tried like three years ago, but I didn’t find it was something for me so I dropped the course. Hergenreiter was less willing to recommend online courses to a friend. Could winter bring a tuition freeze?